After being lost in a transporter accident while trying to help a distressed Romulan vessel, Geordi and Ro awaken to discover that they are invisible and immaterial. This is another episode that raises a question of logistics concerning Troi's telepathy. Clearly, there has to be a physical mechanism in place, which would explain why she no longer senses Ro and La Forge. The fact that Data so easily closes the door to the Romulan engine core after Worf and Riker were unable to proves, once and for all, that Data is stronger than Worf. This would have been a thematically relevant episode (and narratively plausible one) in which to bring back Sela, since the only real death the crew has dealt with thus far has been Yar's. With La Forge and Ro apparently dead, but not really, it would have been interesting to have Sela there as a reminder of Yar being gone, but not completely. Alas, now that there is an episode where her inclusion would have made sense and bore fruit, the opportunity is missed. So, if they can't physically interact with the matter around them--meaning they can walk through walls--how come they don't fall through the floor? Now that I think about it, why does the artificial gravity work on them at all? Data volunteering to arrange the memorial service is an important step for his character, recalling his earlier explorations into the nature of death following "Skin of Evil." It's nice that one of Worf's security concerns--in this case, his worry about giving the Romulans a Federation computer core--is finally taken seriously by a senior officer. The choice of Ro and La Forge is a good one, because it takes the most spiritual character--the Bajoran--and the most skeptical character--the Chief Engineer--and puts them in a situation where they become the show's Mulder and Scully. It's convenient that Data has to travel by shuttlecraft so that La Forge and Ro can tag along. It makes perfect narrative sense, too. Good writing. I love the conspicuous Romulan who suddenly gets up and walks through the computer console to follow La Forge and Ro menacingly. It's a great twist (although I question how he could be sitting in a chair to begin with, unless the chair is also phased). When La Forge walks through the console in Engineering, you can see his reflection on it. It's a subtle but good bit of visual effects work. 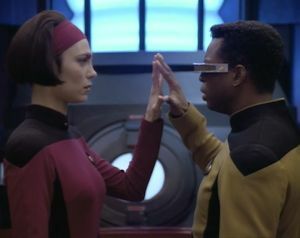 "Geordi, it's good to see you." Nice touch. Despite how easy it is to nitpick and how many logistical questions come out of it (how do they breathe? ), I really like this episode. Ro hasn't gotten nearly enough attention up to this point, and this episode finally does her some justice. Though La Forge doesn't really go anywhere, he is an absolutely essential ingredient to make the story work. I like the science-fiction and the metaphysical undertones, and even though it doesn't really make sense, it gets you thinking. The story has good twists, mystery, and suspense, along with a really interesting tone. I love scenes like the one where La Forge comes to Ro's rescue while Data talks calmly with a random guy about chronoton particles in his room; it's entertaining, but perfectly logical. Finally, the idea of Ro and La Forge returning in the midst of their own memorial service is pretty damn awesome. If Ro had been in the show a bit more, it might have been interesting for the writers to explore a potential relationship between her and La Forge. They have the potential for some chemistry in this episode. We will come across a working Federation interphase cloaking device in "The Pegasus" and an alien one in VOY's "Distant Origin."